The central theme for your wedding should be representative of your tastes, your personalities, and your life as a couple. The wedding theme is the driving force that helps everything fall into place, from the location of the wedding to the attire of the wedding party. Need some help figuring out what your wedding will say about your life? Grab some ideas here from our D.C. list. Who It's For: The chic city wedding is for the couple who loves the urban life and everything it offers. Skyline views, chic dining at trendy restaurants, and visits to the Smithsonian museums represents your lifestyle. What you'll include in your wedding: A casual affair you won't have, but a sophisticated soiree you will. The bride's gown will be sleek and modern. The groom's attire will be black tie with a minimalist attitude. Your ceremony will feature simple calla lily bouquets with long stems wrapped in organza fabric. Your wedding reception will include a cocktail hour with metropolitan drinks before the food is served. Where you'll have it: You'll book your reception at a hotel like the Park Hyatt because the stylish décor embodies the uptown feel. You can expect the food to be superb (the Park Hyatt's Blue Duck Tavern is award-winning). And its central location makes it easy for guests to stroll along Georgetown shops and visit the monuments. Who it's for: Your vision of a wedding belongs in a fairy tale. You love period pieces on the big screen. What's a better pastime than visiting historical sites and learning about an era gone by? And on your days off, you're engrossed in a novel with a happy ending. After all, isn't that the story you're living? Where you'll have it: Should there be any question? The historic landmark Evermay makes the perfect choice for the wedding for romantics. With a 19th century mansion built in 1801, rose garden terrace, and delicate fountains, there are over four acres of enchanting grounds to take in during your event. Who it's for: For you, life is much more about embracing new opportunities rather than running the rat race. Given the choice, you'd much rather spend your weekend on a hike and engaging the scenery outdoors than languishing in a building somewhere. What you'll include in your wedding: Your wedding will be much more about letting the natural surroundings become the setting for your wedding rather than creating an environment of your own. You may even decide to incorporate green elements into your affair like organic foods on your menu and environmentally friendly soy candles to light up your reception tables. Where you'll have it: Lots of expansive outdoor grounds, like the 26-acre wooded parkland surrounding The Lodge at Little Seneca Creek in Boyds, Maryland give you the opportunity to have your space and shelter too. For a more lush and colorful setting, opt for the nearby Brookside Gardens in Wheaton, which allows you to house receptions in the Conservatory or the Reception Hall. Who it's for: You like décor that makes a statement. You love things that are eccentric, but anything classic is so blasé. You'd rather take a bit of a risk than go the path often traveled. You love to discuss what's new, what's different, and what's got it going on with your close group of friends. What you'll include in your wedding: You're not afraid of mixing things up a bit. If you're the bride, you'll wear an ivory gown, but mix in a surprising dash of color. 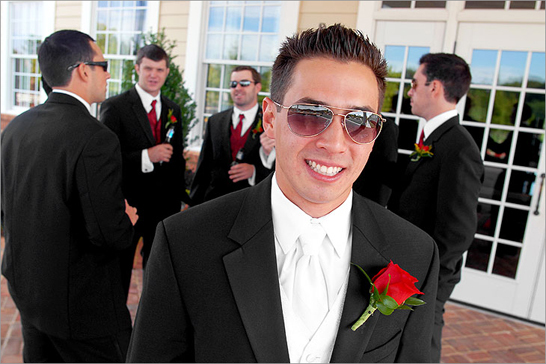 If you're the groom, you'll forgo the bowtie in favor of a four-in-hand-tie. Your reception atmosphere will be more of a lounge setting with nary a white-tablecloth on the dining tables. Where you'll have it: You'll book a reception at the Hotel Helix. Why? Because it's fun. It's playful. And it's anything but ordinary. You'll find everything from Pucchi-style carpets to Ken and Barbie relaxing on pillows in a surf-inspired guestroom. It's not a mainstream wedding venue, but its meeting rooms are the perfect size for intimate to medium-sized events. Whatever theme you decide to select for your wedding, whether it's one from this list or one of your own creation, remember that ideally, a wedding should be a reflection of you. Draw some ideas from your history together as a couple, your own native heritage, or your engagement proposal. If you're stuck for ideas, get together with your fiancé, pore over old photos and magazines, and just brainstorm. Get creative and just have fun!